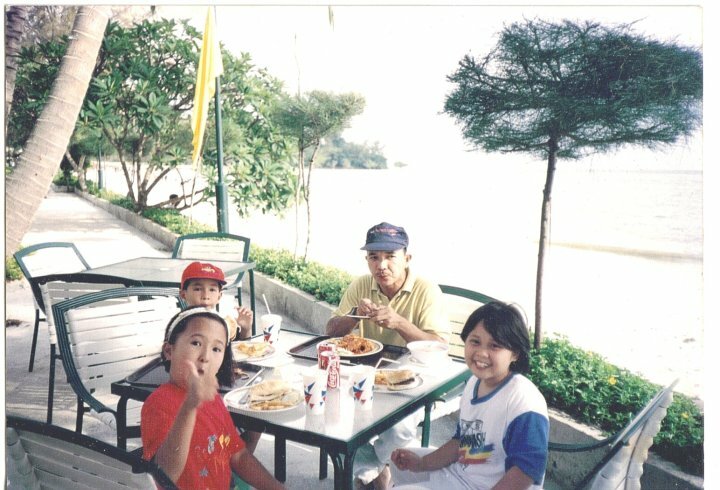 My family and I used to live in Penang for 2 years when my dad was based in Penang Airport.That was when I was 13-14 years old.So I haven't been back in 12 years!Crazy.So much has changed.I went there with my dearest Razin and my friends Adela and her boyfriend Furqaan.Furqaan is a member of Berjaya so we got one room for free and the other one on a discount!Sweet!We stayed there for 3 days and 2 nights. There was quite a number of stalls but the boyfriend said(he has been to Penang recently out of all of us) usually during weekends there would be a lot more(we went on a weekday).We ordered a huge plate of rojak pasembor. I ordered udang goreng tepung(deep fried prawns) and the boyfriend ordered char kuey teow.Adela 7 Furqaan ordered fish and veges with rice.Everything was good! The next day we went to Kek Lok Si Temple and Bukit Bendera.I've never been to the temple but I've been to Bukit Bendera years ago in the old train.Today it is much better and more organized. The view from Bukit Bendera was amazing!We could even see Penang Bridge and the whole of Penang.Next time we should go at night(they close at 10pm) cos I bet the view would be even more amazing. We had our late lunch at Laksa Janggus in Balik Pulau where I used to live with my family.We passed my old house!The laksa was good but the broth was a bit watery.Loveee the bandung soda and also the crispy banana fritters/goreng pisang with had sesame seeds in the batter. Afterwards we went to Penang National Park where Adela &Furqaan took a long time taking a lotttt of pictures.hahaha That's one of their favorite thing to do. Razin wanted to bring me to Gurney Plaza just because.So Furqaan and Adela dropped us there as we wanted to walk back to the hotel later and they were too tired to follow. I love how Gurney Plaza had a lot of restaurant/cafes that we don't have in the Klang Valley.One of them was Macaron Cafe and I love their macarons!I think they're better than Whisk!I bought 5 different flavors--my fave was the English Rose,Salted Popcorn and Black Sesame.Didn't really like the Jaffa or Lychee. Had Creme Brulee at Tong Pak Fu with Razin.We shared a bowl of course!haha It was good & we'll definitely have it once in awhile again as we know their outlets are all over Klang Valley. We had Ferrero Milkshake from Milkshake Factory as well.I've heard about them before but that their KL outlet has closed down.But the guy told us that they'll open a new one in Lot 10 soon!We love their milkshake.It was just nice and wasn't too sweet.Plus they used low fat/fat free milk. Razin finally got the gelato to redeem the bad one we tasted the day before.It was so good!I hope they have outlets in the Klang Valley.They allow you taste any flavor you wanted.The shop we went the day before only allowed one flavor to be tasted per customer.So stingy!Anyway,it was nice walking back to the hotel,just the two of us for 20 minutes.It was perfect and I still remember it.The little things in life! :) Oh,he bought me a super pretty clutch from the mall as well!I love it! At night we went to Batu Ferringhi to the night market and had dinner there.I had the salmon teriyaki at the I love you cafe(hahaha).It was really good and the rice was really fluffy.Razin had the mackerel and I can't remember what Adela and Furqaan had. The next morning,the boyfriend brought me to Hard Rock Penang for breakfast.I think it was the most expensive breakfast he has spend on me.haha Initially he wanted to bring all of us to Hard Rock the night before but since suddenly it rained while we were in Ferringhi,the plan was scratched.Adela & Furqaan spend the morning swimming at our hotel so they didn't go. The breakfast spread was good.Among the normal items on a breakfast buffet,there was some unusual ones like roasted beetroots,dim sums,roti jala(rarely on a breakfast buffet in hotels,and I've stayed in quite a few).They had waffles as well! This is candid as well hahahaa But it looked like I was dancing! After checking out,we went to they Toy Museum.The entrance fee was rm15,quite expensive but there was a lot of toys though the place was stuffy,the air conditioning was low and it was dusty(my nose is very sensitive to dust so I was very uncomfortable! ).Plus,the toilets was horrible.Poorly maintained! So,I came back from Penang on Friday night and on Saturday morning,I went to Port Dickson with my family.Barely had time to rest haha.We stayed at Regency Resort & Apartments.My family have been going there since I was in primary school! We went to PD because my dad's 50th birthday fell on Friday and also he had a work thing nearby our hotel..a seminar of some sort.So we stayed until Sunday. Bundle loot!All for rm15..no joke! Had cendol pulut to cool us down from the heat..it was goood! Captured this using just my iPhone 4S! At night we went to have dinner by the beach.Back when I was little(pic below),we used to eat there everytime we stayed at The Regency.The food was good and although the price was a bit high,the portion and taste makes up for it. the right,my dad&brother at d back. This chicken chop was delish! !